The only child of Edward and Constance Garnett, David Garnett (1892-1981) was born into a life of letters. He studied botany at college but soon returned to the literary circles he was accustomed to – particularly the Bloomsbury Group – and pursued a career in writing. Garnett wrote prolifically and successfully throughout the 1920s. His first wife, artist Rachel (‘Ray’) Marshall (1891-1940), provided woodcut illustrations for several of his works, including Lady into Fox. Garnett maintained intimate relationships with members of the Bloomsbury Group, including with painter Duncan Grant (1885-1978), the father of his second wife, artist Angelica Bell (1918-2012). 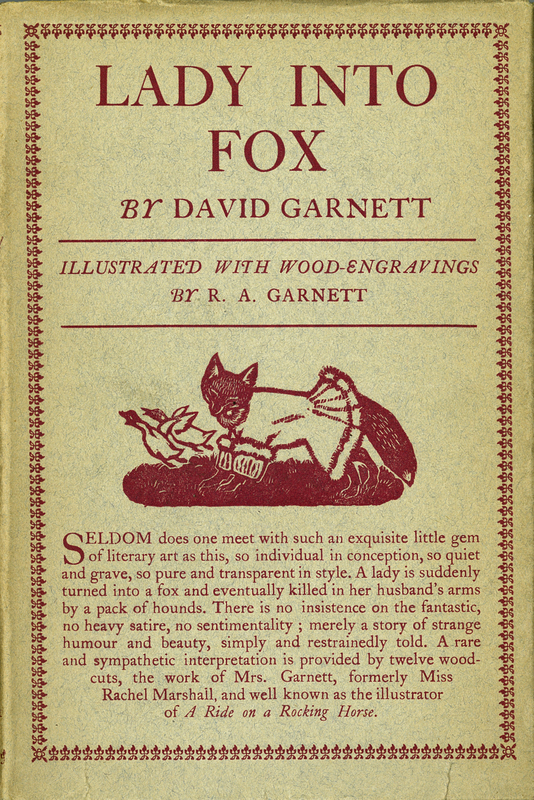 David Garnett, “Lady into Fox,” ourheritage.ac.nz | OUR Heritage, accessed April 26, 2019, http://ourheritage.ac.nz/items/show/10219.